Jash Photoluminescent Tape are made from Jash photoluminescent pigment and good quality PVC material. After absorbing visible light for 10-30 minutes, Jash photoluminescent tape will glow more than 8-12 hours in the darkness. 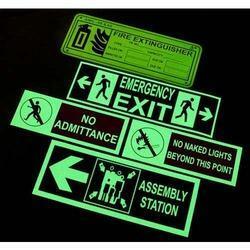 Photoluminescent signage are very necessary part of any industries, because from safety point of view, its play very important role. 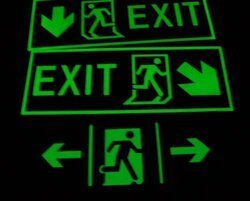 we are manufacturer of all types of Photoluminescent signage with maximum Night Glowing, it working when power failure occur. Hot thermoplastic & cold solvent based road marking Machines used for marking of city roads, highways, sports fields, airports etc. They are used to mark straight as well as curved lines with accurate precision to eliminate human error. Thermoplastic road material confirming to BS & AASHTO specification & Solvent Based road marking paints as per IS:164 Grade-I are also Available.